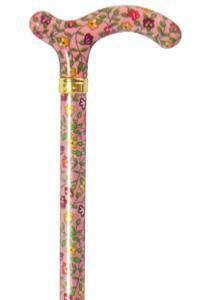 An extremely popular contemporary walking stick, often bought as a present or as an accessory for a particular outfit. The charming pattern features little flowers in various shades of peach, red, purple and yellow, with green leaves, on a peachy-pink background. The pattern is applied to both the shaft and the handle, and the Chelsea cane is fitted with a neat brass collar and a rubber ferrule. Ferrule diameter 16mm.